Framed art is in every home and office. It is estimated to be a seven-billion dollar/year industry, yet it is estimated that only about 5% of the American public have done custom framing. Now you can look at that as a glass half full or half empty; we see it as a great opportunity! You see, we live in an image conscious society and if a picture is worth a thousand words, then the art on our walls has a lot to say about us – our lifestyle, where we have been and where we are going. Even in tough times when people are going out less and entertaining more at home, they want their home to look nice when friends and relatives come over. So, why haven’t more people done custom framing? It’s simply human nature! We enjoy doing things that are easy and fun, but avoid tasks that may be difficult and challenging. This is a fragmented industry that uses an antiquated distribution system involving many layers of middlemen, each taking a profit and driving up the price. Fancy Art,*N.F.P. does business differently. We've developed concepts and innovations that are revolutionary. By streamlining the system and eliminating the waste, we have made it easy and fun for our customers to create a personal masterpiece at a reasonable price. It’s like “Build-a-Bear Workshop” for grown-ups. People love it and come back again and again. Design, layout of equipment and full specification. A one-week training program to instruct you in the operation of your new store including: Familiarization with Framing Terminology and Design Concepts; Point of Sale & Fancy Art Order Management System (FOMS) training; Complete inventory management procedures; Assistance in management and personnel hiring; Public relations, advertising, marketing programs and promotions. Complete operations manual with frequent updates. Ongoing visits from our field staff of supervisors. Royalty fee: he present royalty fee is 7% of gross volume. This is paid to the franchisor weekly. Advertising fee is 4%. If you meet the qualifications outlined above, we’re eager to talk with you about this exciting opportunity. 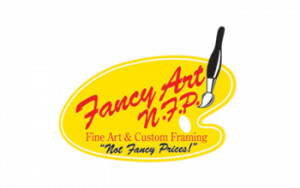 Please refer to the apply tab to fill out our, confidential, request for consideration, to learn more about a Fancy Art, *NFP® Franchise opportunity. We will look forward to our becoming better acquainted!